Is ‘From Natural To Relaxed' A Growing Trend? These were the six words that came out of my mouth when I finally made the decision to go back to relaxers. It was a decision I’d been turning over in my mind since the beginning of the year and in July, it was settled: after 7 years of being natural, I was officially done. Essentially, I felt like a traitor: how could you blog about natural hair for years and then turn around and go back to the creamy crack? 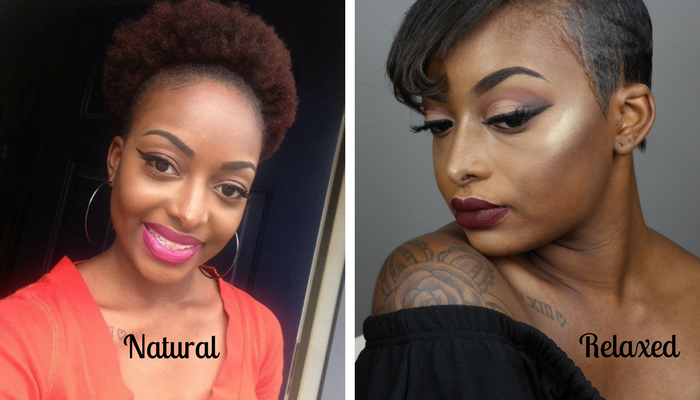 Becoming a natural hair blogger was really about this quest to learn how to love my own natural hair. So when I really thought about it, I came to this shocking realization that I don’t love my natural hair. I always wanted to, but I really never did. I spent all of my time keeping it stretched out or in box braids, trying to avoid knots and tangles. I never even attempted a “wash and go,” rarely wore a twist-out, and stopped attempting curly rod sets after humidity reminded me it was not my friend for the last time. I was natural, but my hair was always tucked away. Even after all those years of being told, “Love your natural hair! Rock your fro!” None of it ever stuck. And when it comes to natural hair, there are several schools of thought. Some believe that if you’re not happy with your natural hair, you’re not happy with or don’t love yourself because that’s the hair the good Lord gave you. That if you don’t have natural hair, you’re not woke. That if you relax your hair, you’re trying to be white. 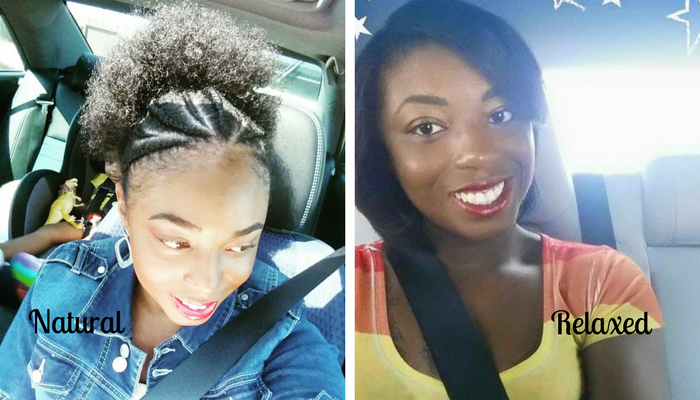 I had allowed the opinions of others to shape how I felt about natural and relaxed hair. It was time to take a step back and decide what was best for me and my lifestyle, without allowing the opinions of society be a factor. The first time I seriously thought about getting a relaxer was one day shortly after getting my hair flat ironed. It had been about 10 months since the last time I used heat, so I was really looking forward to seeing how much my hair had grown. Long story short, my hair didn’t even last a full day. Looking back, my natural hair never stayed straight beyond a week, and I love my hair straight. So I was constantly disappointed. 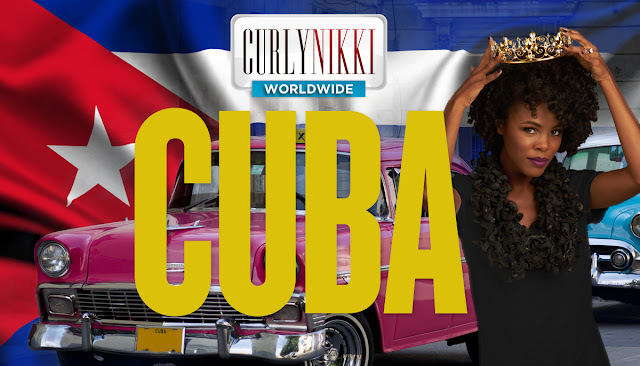 In fact, all of the styles that I really love on myself—straight and sleek, flexi rods, CurlFormers—never last on my natural hair. 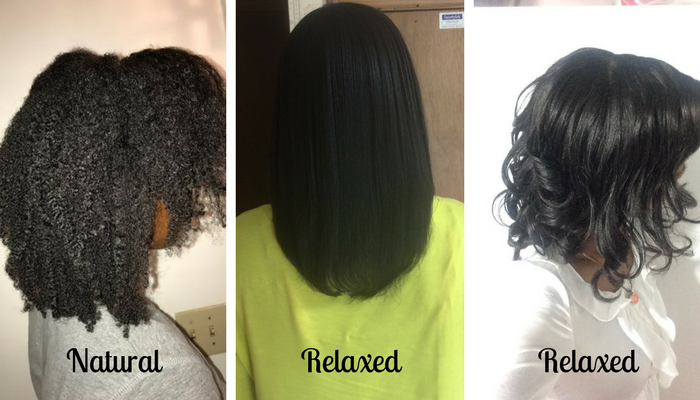 I started really doing my research, delving into the world of relaxed hair again, and I discovered that many women went natural because of haunting relaxer experiences, which often happened at the salon. The truth is, it wasn’t that I couldn’t grow long, healthy relaxed hair: I just never learned how. I had been going to stylist after stylist for years, depending on them to make my hair grow and yet it still stayed at neck length. In 2009, I started researching healthy hair care practices and learned basics like staying away from heat and using sulfate-free shampoo. In 3 months’ time, my hair had vastly improved. Shortly thereafter, my cousin suggested that I should go natural, like her. I didn’t even know what “going natural” meant. After looking into it and seeing so many women whose hair seemed to “take off” after they stopped getting relaxers, I was hooked. I would finally have long hair, like I’d always wanted. And to be honest, my hair did thrive, especially in the beginning. I did the big chop in 2010 and within two years, my hair was shoulder length, the longest it had ever been. After a bout with heat damage, I finally reached APL (arm pit length) at year 5, and despite trying everything possible to surpass this growth plateau (scalp massages, protective styling, hair vitamins, healthy eating), my hair has remained there. I attribute the stunt in my hair growth to a constant struggle with dryness that has resulted in an endless cycle of growing and trimming, growing and trimming. 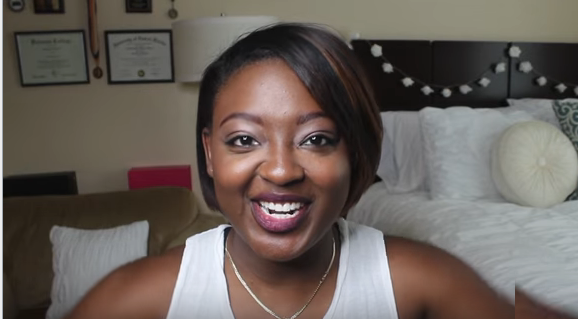 When it comes to length retention, the struggle has been real. In my quest to find other women who had gone from natural to relaxed, I was pleasantly surprised to find that I wasn’t alone. I reached out to four women, and all of them touted some of the same reasons for relaxing as I had. Caitlynn Collins, who was natural for one year before going back relaxed, says, “I made the decision because I went natural without doing my research and that hurt me rather than helped me. I didn't have the knowledge I needed and my natural hair just wasn't flourishing. I love my decision and wouldn’t change anything.” In her video, entitled, “From Natural to Relaxed Hair,” she elaborates further. For me, it was very hard being natural. I had very, very thick, very porous hair. It wouldn’t hold moisture. All the little cute hairstyles I would see other naturals do on YouTube, I would try it and it would look nothing like theirs. It would look so horrible. I was over it! I have been openly judged by complete strangers. My family and friends support my decision because they saw how much I struggled. With me being a YouTuber, a lot of naturals left very long, nasty comments under my video. One lady even went as far to say that all of my hair was going to fall out! I just ignore them because they don't know my story. I relaxed on August 24, 2017 and over the course of the last month, there hasn’t been one second that I’ve regretted my decision. 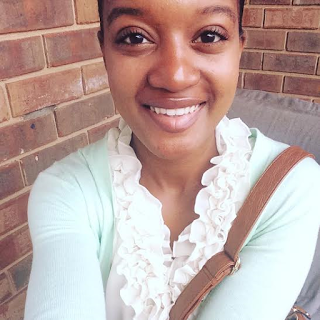 The week before getting a relaxer, I was so worried. I had horror visions of my hair falling out. But from start to finish, I had the best experience. The relaxer took well and did not burn. My hair retained a bit of texture and was not over-processed, and in the end, my hair was straight, sleek, and swingin.’ And the best part of all: it didn’t revert. 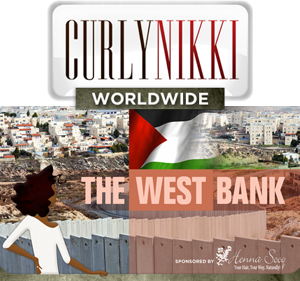 For the last few weeks, I’ve been wearing CurlFormer sets out like there’s no tomorrow. I honestly feel like a weight has been lifted off of my shoulders and only wish I had done it sooner. 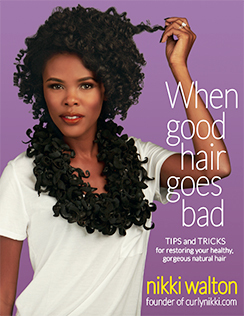 There’s nothing difficult or cumbersome about maintaining relaxed hair. Wash day took a significant amount of time and dedication when natural. Obviously, it’s easier to get to my scalp now when I wash my hair, and detangling my natural hair took 30-45 minutes while relaxed, it takes 2-3. I love natural hair—I think it’s so versatile and beautiful. There are so many types, textures, colors, and styles. I love the natural hair movement and I think realistically, that’s what I was so excited to be a part of, this wave of acceptance that gave women such an important gift: the tools and the knowledge to take care of and grow our own hair. This really isn’t about #teamnatural or #teamrelaxed. It’s about the fact that no one should have to feel bad about doing what’s best for them and their lifestyle, especially when it comes to hair. I witness so much hate on the internet directed at women who choose to get relaxers. It’s just plain wrong. Rather than judge one another, it’d be nice to just have a conversation and offer understanding. 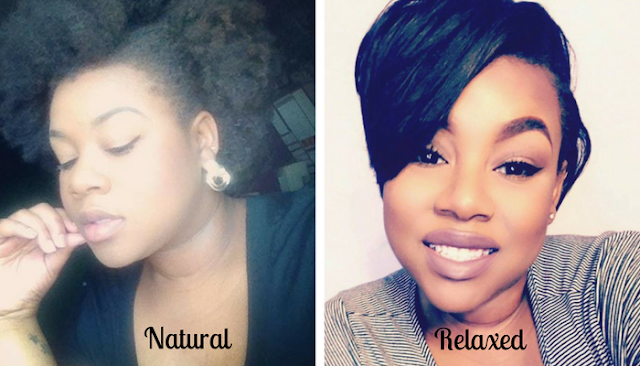 Have you thought about going from natural to relaxed?